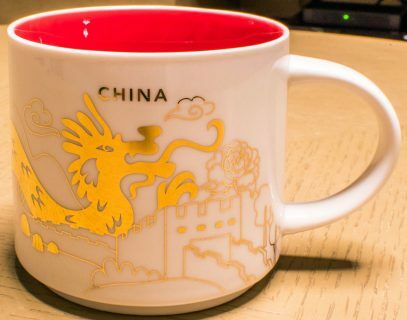 Even though it’s not Christmas yet, Starbucks decided to come up with one of the most beautiful mugs from soon to be discontinued series – You Are Here Christmas China. Again, considering the release date, we probably better call it You Are Here China Gold? Regardless, I have to repeat, this mug looks amazing. My understanding this is due to big dragon, which is not just outlined, but fully painted with Gold. This is probably one of those “must have” mugs every collector should get. Do you agree? Hello! A friend on Facebook in the You Are Here Facebook group said this is actually not a holiday mug, despite it’s appearance, but a special design for China. The gold symbolizes “completeness, nobility and wealth.” Also, in Chinese culture the red box symbolizes fortune and joy. That would also make sense as to why this was released in June. Also, if you notice, there are no holiday themed graphics to be found on the mug.